Getting ready for winter driving requires a little more than just checking your anti-freeze. 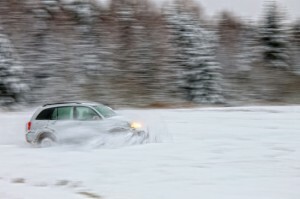 Here are some North Carolina winter driving tips to keep you safe. Keep cold-weather supplies in your trunk. At minimum, these should include a properly inflated spare tire, a blanket or two, a bag of salt, snow boots, a flashlight with fresh batteries, reflective triangles or flares, a tool kit, a window scraper, a pocket knife or better yet, a multi-function tool, a shovel, a few bottles of water, some non-perishable snacks. You never know when you might get stuck somewhere and might have to kick into survival mode. Keep your ears open when your community is threated with bad winter weather. Your best bet is to avoid the roads all together but if you must get out be sure you know if there are road closures and consider allowing time for crews to get roads cleared. Be sure your car is ready for winter with appropriate and properly inflated tires, good windshield wipers, topped off fluids, good brakes, a strong battery and plenty of gas in your tank. Keep your mind on the road. Avoid distractions such as talking on the phone, eating, texting or anything else that might take your eyes away for just a second. Even having pets in your car could be detrimental. If you travel with pets, consider pet restraints. This keeps them from unexpectedly jumping on your lap as well as help protect them in an accident. You can buy these at many pet supply stores. Watch your speed and keep a safe distance from other cars. Remember, slowing or stopping on snowy or icy roads can be challenging at times. Be sure you and all your passengers are wearing their seat belts properly. You should also ensure your child safety seats are both the right size for your child as well as properly positioned in your car. If you aren’t sure, there are many agencies that can check this for you. Just ask and we’ll point you in the right direction. Don’t use cruise control on wet or icy roads. It could hamper your ability to stop quickly or cause you to skid. Be sure you drive with your lights on to ensure other motorists can see you. Be extra cautious on bridges as they could ice over before you even notice ice on the main roads. Most of all, use common sense and allow yourself enough time to safely arrive at your destination. For other great tips, you can download this brochure from the National Safety Council or visit the North Carolina Department of Transportation website. Here at Protective Insurance Agencies, we want our customers to stay safe in the winter as well as every other season. We hope these North Carolina winter driving tips help you and your family as you prepare for winter in North Carolina. Have you shopped your auto insurance rates lately? If not, give us a call and see if we can save you money on your North Carolina auto insurance. As an independent agency, we can shop the rates of multiple carriers at one time and often find a policy perfect for your budget.